We have been getting a great response for the Roboversity-IUCEE challenge. A lot of students are using this opportunity to learn about Human Machine Interaction by participating in our Gesture Based Robotics Workshops. At the same time, a large number of students are unable to utilize this opportunity as they find it difficult to attend these events at fixed locations and at fixed times. Also the travel and accommodation costs to attend these events in a different city are making it difficult for students. So we are happy to announce that we are launching an online course to help students learn this at a low price and greater convenience. Now you can learn Gesture Based Robotics and participate in Roboversity IUCEE challenge from anywhere in the country at economical price! And don’t worry, we made sure the quality and learning experience you gain through the online course is no less than a regular workshop. You can view our demo before signing up and we have a 100% refund policy if you are not satisfied with the course. How do I get kits for the project? Once you enroll for the course, the hardware kits will be shipped to you within 24 hours. You will use them along with online videos to build the robot. Why develop a Gesture Based Robot online? By doing this online course, you will develop Gesture robots at your convenience. Anytime. Anywhere. At your own pace! We are following the methodology of Learn-Do-Review for successful practical learning. Our courses are divided into a number of smaller modules with each module having 3 parts. Learn – In the learn modules, you will learn the technical concepts involved in Gesture Based Robotics. We have linked traditional teaching style with real problems from the world of Human Machine Interaction. The session involves video lectures along with demonstration of how humans and machines work together! Do – In every Do module, you’ll build a part of your robot. 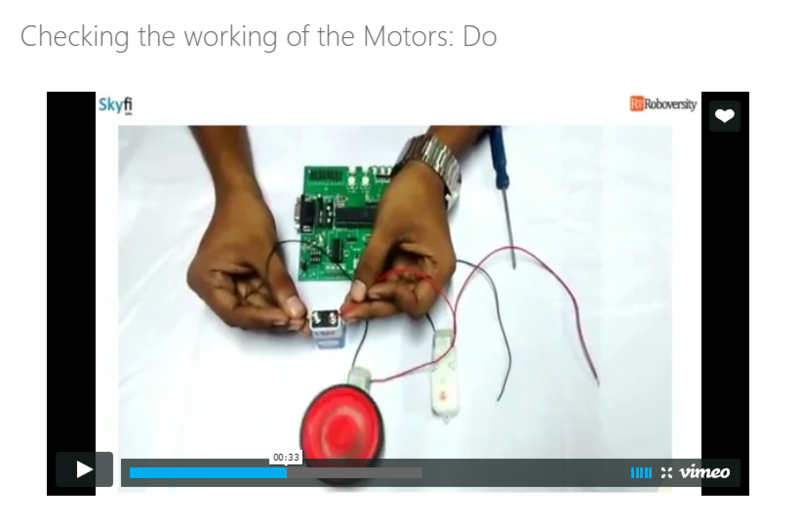 For instance, if you want to make the motors work, you will see detailed videos on how to do it yourself. Review – Each Learn and Do sessions are followed by a quick review quiz. This is to see if you have learned the concepts well enough before moving on to the next module. It is better to answer questions while concepts are fresh in your mind! You have enough time to tinker with your bots. We all know how important that is! You also have the golden opportunity to enter a national level competition on Human Machine Interaction – the Roboversity IUCEE Challenge 2016. After building an initial Gesture Based Robot, you’ll need to start planning for a robot based on competition guidelines. So, as Aditya said, dive in and experience the new way of engineering learning!